Outstanding 3 Bedrooms/3 Baths Beachfront Apt. Avenida del Mar 1323 4B, an outstanding three bedrooms, three full baths, top-floor apartment sitting on the beach in the exquisite town of Pinamar, arguably Argentina's best beach town. Located only three hours from Buenos Aires, this incredibly charming and tastefully decorated apartment boasts incredible views of the beach, Atlantic Ocean, and a golf course only steps away. It includes a private terrace with built-in brick barbeque and pool in the backyard. Also, it has high-speed internet, a local telephone line, and cable television on a large flat screen. All dishes, cookware, garage parking, and full maid service are included. months. Tourism is what fuels the economy during the summer. Two facts set Pinamar apart from most of the other Atlantic Ocean beach cities, it is a planned city with a very strict building code, and it has been artificially turned from wild sand dunes into a forest (mostly of pine trees, which explains the "pina" in the name). City planning, as defined by founding architect Jorge Bunge and maintained by elected authorities ever since, translates into a city mostly made up of residential houses with open gardens; that, together with the pine forest, combine to make the city a very nice setting. That explains why it has been chosen as the summer resort for many well-to-do Argentines, in particular those living in Buenos Aires. Pinamar boasts miles of unspoiled beaches and limitless activities ranging from tennis (grass and clay courts,) golf, horseback riding, ATV and bicycle rentals, 4x4 dune driving, surfing, windsurfing, kite sailing, surf fishing and fishing excursions, and polo matches. There are dozens of fine restaurants, movie theaters, bars and night clubs, and balnearios (seaside resorts)- some with beach-only access. To get there from Buenos Aires, it"s a three-hour drive on a very good highway. Means of public transportation are hiring a car and driver or taking the bus (most companies offer full-comfort with totally-reclining seats.) 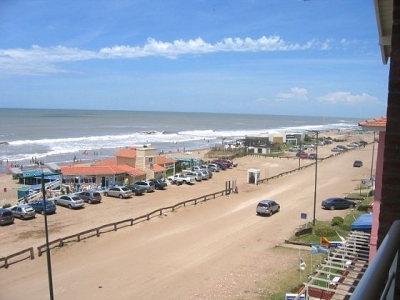 Pinamar is also just an hour away from Mar del Plata which has an airport and train service. After twenty years of traveling the globe, Pinamar was one of those rare finds where after spending just two days there I knew I would be returning to this place for the rest of my life. On the third day, I had put a deposit down on the best apartment the city had to offer and soon after fulfilled my life-long dream of owning on the beach. Pinamar is an Argentine coastal resort town located on the coast of the Atlantic Ocean in Buenos Aires Province. Located less than 400 km (249 mi) south of Buenos Aires, it is one of several small seaside communities that line the coast. Pinamar is arguably the best beachtown in Argentina. It has a long, beautiful beach, golf courses, tennis courts, horseback riding, and all other amenities available.